Left: Former finance minister Pravin Gordhan. Top-right: Former president Jacob Zuma. Bottom-right: Ajay Gupta (left) and Atul Gupta (right). Pravin Gordhan only officially met the Guptas once, and that was at a meeting requested by then-president Jacob Zuma somewhere between 2009 and 2014, Zuma's first term. But Gordhan refused a meeting with them later on. He did however come into contact with the family at the centre of state capture at least three other times, with two of those occurring at public and government events and the third at a business meeting. This is according to a 68-page sworn statement signed by Gordhan on 11 October 2018 and delivered to the judicial inquiry into state capture headed by Deputy Chief Justice Raymond Zondo. Gordhan, currently minister of public enterprises, will deliver his testimony next week. He is, however, said to be angry that the statement has been leaked and is believed to have asked the commission for an explanation as to why it has not remained confidential. Tony Gupta insisted on a meeting between Gordhan and an Indian businessman who wanted to buy a stake in MTN. The EFF on Wednesday issued a statement after details of Gordhan's contact with the Guptas was published by BusinessLive. The party accuses Gordhan of complicity in state capture because the Guptas' "gained traction" during his tenure as minister of finance. 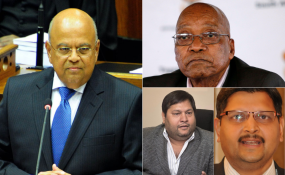 The most significant interaction between the Guptas and Gordhan took place at a meeting which requested by Zuma in the period between 2009 and 2014. According to Gordhan, the meeting was held at the presidential guest house in Pretoria and that Zuma introduced Ajay Gupta as his "friend". Zuma told Gordhan, then finance minister, that Gupta had expertise in small business and finance. "I recall us exchanging generalities for a couple of minutes, but I do not recall the details of what was a very cursory exchange. Mr Gupta then excused himself and left me and the former president to continue our meeting," Gordhan says. According to Gordhan, he has never been to the Gupta family's estate in Saxonwold in Johannesburg and he declined an invitation to attend the infamous Gupta family wedding at Sun City in 2013. The statement makes it clear that Gordhan was a target for the Guptas, exactly like his successor as finance minister, Nhlanhla Nene, was. Gordhan also refused to schedule a meeting with the Guptas at Saxonwold "or anywhere else" in 2010 when Tony Gupta insisted on arranging one. He will tell Zondo that he attended a cricket match during his first term as finance minister between 2009 and 2014 and that "one of the Gupta brothers" was also present in the presidential suite. "We greeted but did not speak to each other," his statement reads. Other incidental meetings occurred at government functions after events like the State of the Nation address by Zuma. "I recall one or more of the Gupta brothers would be present at such events. I would see them, but not interact with them," he says. This tallies with testimony by among others Nene, who told the commission that the Guptas were regularly invited to government events, especially during Zuma's first term. In his statement, Gordhan also details a meeting with a wealthy Indian businessman in 2010 who showed interest in acquiring a stake in MTN. The meeting was arranged after Tony Gupta allegedly badgered Dondo Mogajane, then Gordhan's chief of staff to accede to the meeting. Gordhan agreed because the Indian businessman was considered a possible major investor in the country. Gordhan doesn't recall exact details of the meeting because it did not lead to any actual investment, but says that according to Mogajane, now director general at National Treasury, Ajay Gupta did attend the meeting. South Africa: Mokgoro Report - When Will Ramaphosa Act?